A commercial aquaponics system creates immediate jobs and food for semi-skilled people trained in less than a week. Permanent full-time jobs are created and year round food production is available in three months when grown in greenhouses or warehouses. Aquaponics grows pesticide free food, table vegetables and fish, raised in a simple yet revolutionary new technology that replicates nature. Installation can be solar powered. Total sustainability can be achieved by selling most of the food production to local markets. 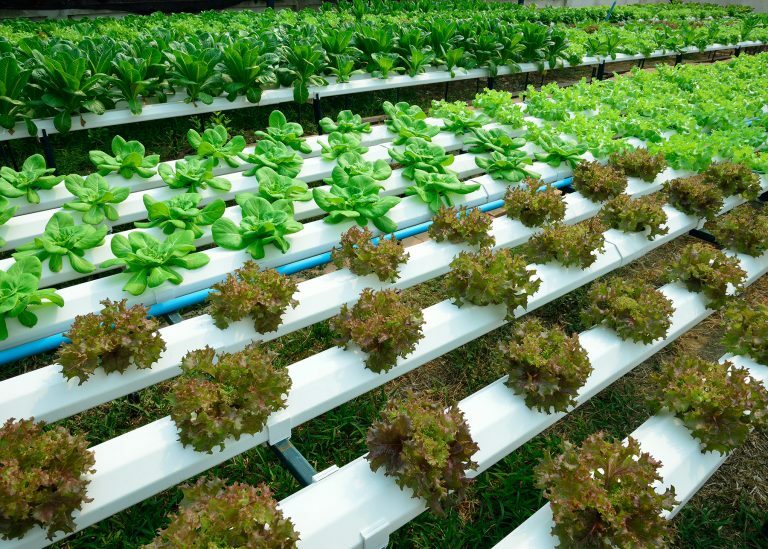 Hydroponics (image above of lettuces) is a very recent technology first noted in the 17th Century; the name itself was only coined in 1937 from the Greek words for ‘water’ and for ‘work’ by William Frederick Gericke of the University of California at Berkeley. 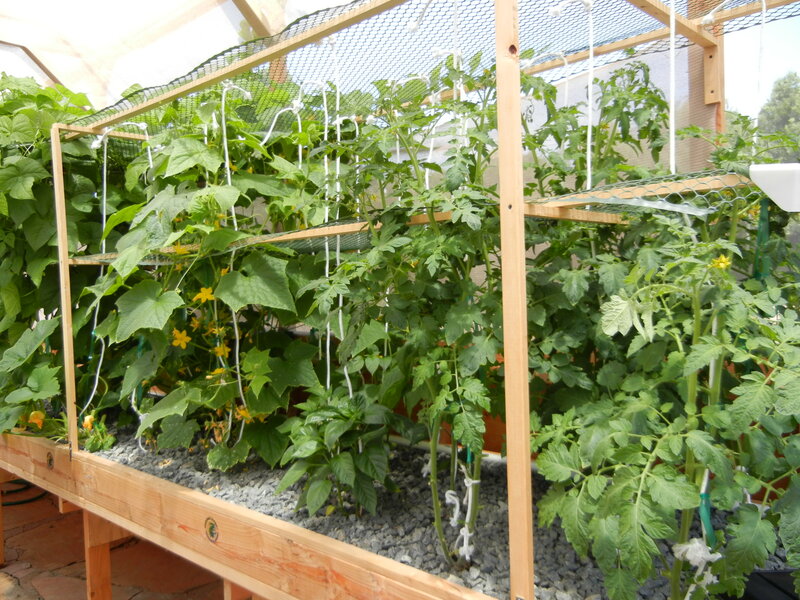 He grew a 25′ tomato plants in his backyard using only mineral salts in water. As amazing and productive as hydroponic is, there is a built in problem with the technology. The nutrient solution used in the growing of the plants eventually has to be ‘changed out’ or it will become toxic to the plants, even if the system is being run organically because some of the nutrients become concentrated in the water and even adding water to dilute it, there comes a time when it must be changed out. Therein lies the rub . . . The ‘liquor’ as it is called, is now designated by the EPA as toxic waste and must be disposed of properly by qualified personal using approved techniques. Another way to say this is that the waste disposal for hydroponics is expensive and needs to be disposed of by experts. 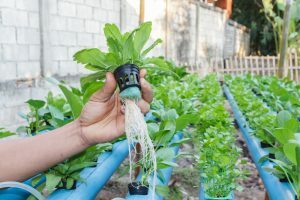 This makes the hydroponic waste removal a much larger expense than most people realize and it’s a topic that’s almost never discussed by those selling hydroponic systems. Hydroponics has a much older and more benign sister, aquaponics that has been around for over 4,500 years and is the exact same system that nature uses to break down waste to reuse the resulting byproducts to grow new plants and this process has been going on naturally for billions of years. In aquaponics, there are no toxic chemicals used in the system. After all, chemicals would kill the fish. The waste products in aquaponics are non toxic, usable on other plants and can even be dumped down a sewer system because they will not harm sewage systems. The waste from an aquaponics system is a valuable fertilizer for plants, shrubbery, trees, or grass. One owner of a small commercial Portable Farms® Aquaponics System even sells his Settling Tank waste as an organic fertilizer and gets US$25 per 5 gallon container and the client picks it up at his greenhouse. Considering that each Module of Portable Farms® produces approximately 50 gallons of waste water every six weeks which can become a nice extra source of income for the installation owner. Insecticides that help control pests on the plants will nearly always kill the fish. Pesticide free-food creates a safer and healthier food supply. Portable Farms® Aquaponics Systems use NO dirt and no chemicals (insecticides or fertilizers) to grow the plants. Farms Aquaponics System: tomatoes, cucumbers and beans. Today, your family can enjoy one of the oldest food-growing technologies wrapped up in a modern, easy to build and operate system in your own backyard, patio or greenhouse. There have been over 300 different varieties of plants that have been tested and can be grown successfully in a Portable Farms® Aquaponics Systems. For example, lettuce is considered a variety but there are hundreds of variations of lettuces that grow well in aqupaonics. The same is true for peppers, beans, etc. The major food groups that are not recommended for Portable Farms® are root vegetables (carrots, potatoes, onions, etc.) and field crops such as corn, wheat, soy or rice. Perennial plants (strawberries, blackberries, asparagus, etc.) are not recommended because the plants are dormant many months each year and do not produce harvestable food year round. Plus, we recommend growing all plants from seeds and not bringing in plants raised in soil into the structure which can introduce pathogens that can harm the other plants in the structure. Do you have to use fish? I do not want to. what would be the alternative? I read about Brightfarms which is operating greenhouses using hydroponics. I am wondering they would be better off with aquaponics instead. Maybe AQ is a bit complicated and fish is not what they want? Everyone has to make these type of choices for themselves. Aquaponics is actually less complicated because you are not adding chemicals all the time.